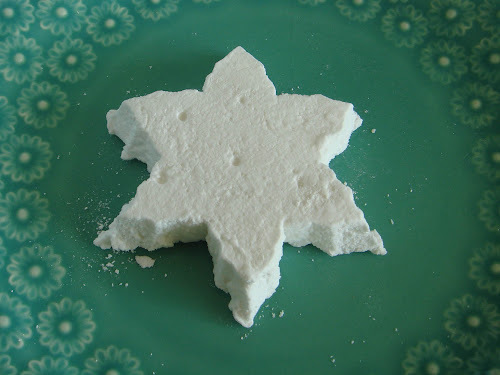 This isn't the first time we've posted about homemade marshmallows on foodspiration. 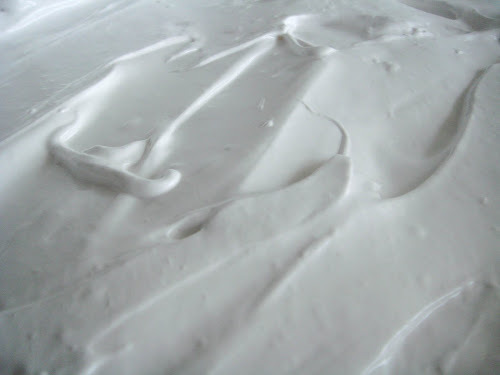 In fact, that link shows our step-by-step photos of how to make this deliciousness and links to the recipe I used. We've blogged twice about this because we're in love with the light, pillowy texture of these little clouds. Ok, they are so good that I just had to step away from writing this post to go and eat one of these marshmallows! We used Martha's recipe as we did in our previous post but I wish I had remembered to spread the marshmallow into two pans not just one 9 X 13. Because we were cutting shapes, the 9 X 13 pan made very thick marshmallows which were almost too big for the cookie cutter to get through. So consider putting this sticky yumminess into two pans and having slightly less thick marshmallows. 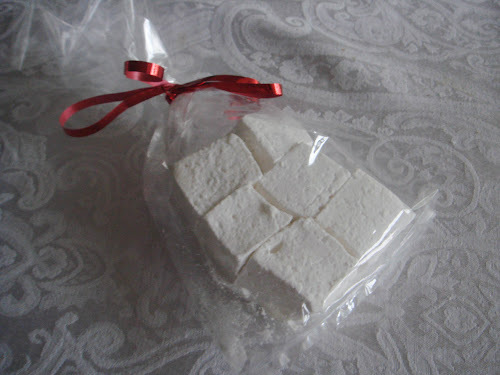 I actually had to cut the shape and then half the shaped marshmallow with a sharp knife. 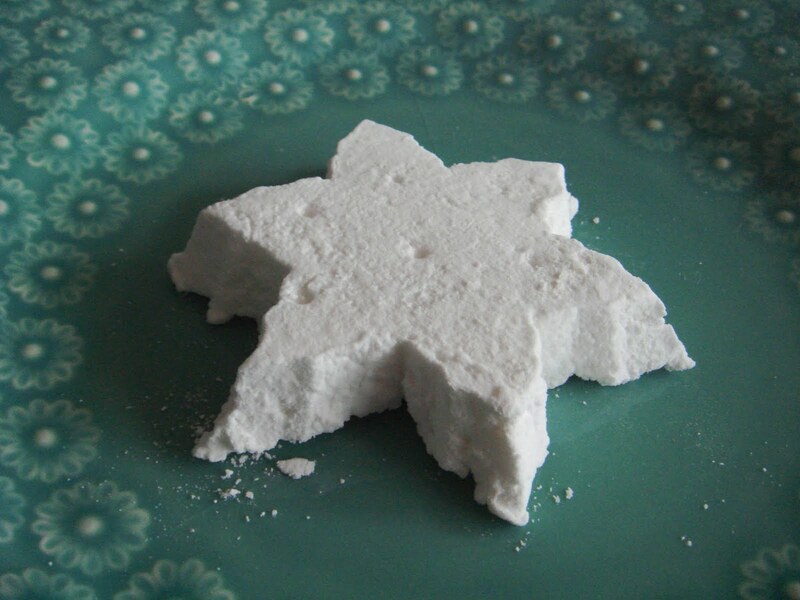 For this batch, I wanted to make snowflake shaped marshmallows instead of the simple stars from before. Now, I am impatient...and I didn't let my marshmallows set for 3 hours so they were a little soft. And with some help from my neighbor, we were able to get a several large snowflake ones out- but it wasn't easy. It's good to note that complex shapes really don't work here- we tried smaller snowflakes but the detail got lost and the marshmallow got stuck in the cutters. 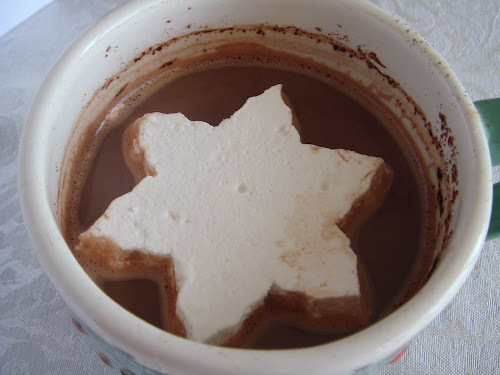 The marshmallows taste great on their own but they also look fantastic in a cup of hot cocoa! These required a very large mug however! Shapes are great but they do create quite a bit of scrap which still tastes good but doesn't look as nice. We actually cut a lot of the scrap pieces into squares -some which I wrapped and gave out. I'm also thinking about what we could do with the misshapen pieces...coat them in chocolate perhaps? These were your basic vanilla recipe but next time I'm thinking about trying a flavored recipe. Have you eaten a flavored marshmallow that we should try? Got a recipe that you can share? Can you do a vegan version? Would love one! Hmm, will look and see. I know they are out there.